Weekly Market Analysis: April 4th to 8th 2016 - Find the best Binary Options Brokers, Binary Options Bonuses, Binary Options Signals, Binary Options Software and everything Binary Options related on Binary Options Directory! Weekly Analysis: The entire last week was bullish and the pair came very close to the resistance at 1.1450, which represents a key level for medium term price action. All this happened despite a higher than expected number of new jobs created in the U.S. The bullish momentum is starting to fade and long wicks start to appear in the upper part of candles. 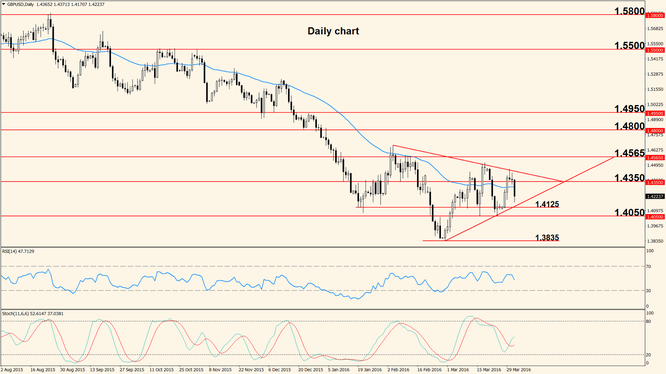 Friday we saw some bearish action triggered by the NFP release but overall, movement was mixed and the gains made by the US Dollar were erased. However, we are likely to see the effects of the encouraging NFP extend throughout this week and we expect the pair to move south, towards the 50 period Exponential Moving Average. The week ahead is not filled with a lot of economic releases but here are some of the highlights: Tuesday the U.S. Non-Manufacturing PMI will offer insights into the opinions of about 400 purchasing managers about the state of the economy, excluding the manufacturing industry. Wednesday the latest FOMC Meeting Minutes are released, showing details about the reasons that determined the decision to maintain rates unchanged in March; usually this release creates strong volatility if the document contains some hints about the future pace of rate changes. Thursday ECB President Mario Draghi is scheduled to deliver a speech about the European financial and economic situation at the Portuguese President's Council, while Fed Chairwoman Janet Yellen will participate in a discussion at the International House, in New York. Both these public appearances can become market movers but can also go mostly overlooked by market participants. Either way, caution should be used. Friday lacks major releases. Last week the Pound had a strong start but almost all gains were erased by the US Dollar strength created Friday when the Non-Farm Employment Change report came out. Price action is confined within a triangle pattern and the breakout is likely to determine the next medium term direction. 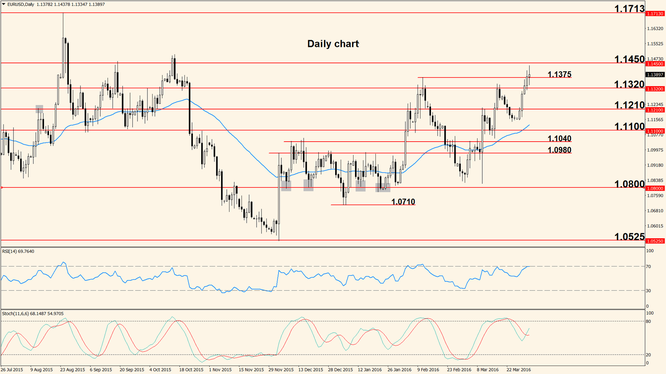 The resistance at 1.4350 was briefly breached last week but as we saw, the greenback is starting to gain back some strength and now the pair is headed towards 1.4050 once again. Also, a higher high has not been printed so our view is bearish-to-neutral until price breaks out of the mentioned triangle. The week opens Monday with the release of the British Construction PMI, followed Tuesday by the Services PMI. Both are surveys of purchasing managers which offer insights into the state of the respective sector and can have a positive impact on the Pound if better numbers are posted. The other important event of the week ahead is scheduled Friday in the form of the Manufacturing Production, an indicator that shows changes in the total value of output produced by the manufacturing sector. Same as with the other 2 indicators, a higher number is beneficial for the Pound and as always, the U.S. events will have a direct impact on the pair’s movement.